I've had a day! Here is how I spent half of it. 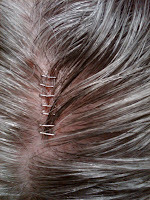 Yes those are staples in my head! Go it in the top of the head by my hatch-back! I'm OK just a little embarrassed. But what a story I have to tell! Thressa, What happened? Do tell us! I am so sorry, those look like they hurt. Now you'll always have a physical memory of Henry!